Opportunities to be supervised by experts in the field, including those affiliated with the Research Centre for Surface and Materials Science, Light Metals Research Centre, and more. Pursuing a PhD at our University gives you access to a high-calibre research community – you may have the opportunity to publish papers, attend international conferences and develop your network in academia and industry. The Department of Chemical and Materials Engineering is home to recognisable researchers in a variety of applicable fields – from food to biomaterials – so you’ll be able to take advantage of the best knowledge we have to offer. Dr Jenny Malmström’s interdisciplinary research examines the interfaces between biology, chemistry and materials science. Her expertise includes the characterisation of material-biomolecule interactions and the influence of surface properties of cell adhesion onto substrates, with applications ranging from the creation of smart materials to the control of cellular behaviour. 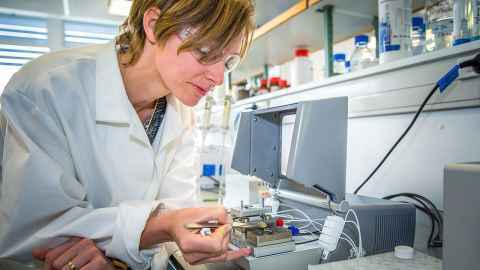 She has been named a Rutherford Discovery Fellow in 2016 and awarded a Marsden Fast-Start grant for her research into better ways to grow stem cells. She is also a Principal Investigator of the MacDiarmid Institute for Advanced Materials and Nanotechnology. There are several scholarships you may be eligible for when you decide to pursue your PhD in Chemical and Materials Engineering, including the University of Auckland Doctoral Scholarships. If you would like to find out more about studying Chemical and Materials Engineering, you can contact a Postgraduate Adviser.